Sweet Christmas [J1476] - $17.10 : Yarn Tree, Your wholesale source for cross stitch supplies. Yummy looking Christmas cakes and cookies displayed on decorative trays and under glass. 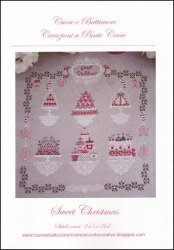 The pattern includes the phrase in English (Sweet Christmas), Italian (Dolce Natale) and French (Doux Noel) Stitch count 245 wide x 267 high.